Great views from well maintained studio with responsive owner. Excellent strip view of City Center, The Cosmopolitan and Planet Hollywood! Free high speed wireless internet, pools (including year round heated pool and free use of MGM's pools in season). Easy access to MGM Casino, Convention Center & monorail station via climate controlled walkway with moving sidewalk. Plus only a short walk to City Center, Cosmopolitan and Planet Hollywood from the front Signature gate on Harmon Avenue. Flat Panel TV in living/sleeping area and bathroom! Full exercise facility on site. Floor to ceiling glass to enjoy the view. I'm live in Charlotte, NC and have enjoyed visiting Las Vegas since my first visit in 1987 (stayed at the Dunes which is approximately where the Bellagio Fountains are now!). I have 3 properties at Signature on VRBO (listings 397813 & 425161) and a beach property in Holden Beach, NC (listing 751993). The view from the 23rd floor of tower 3 is fantastic! 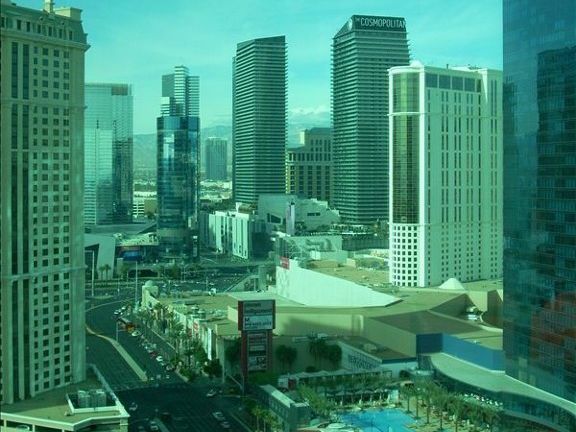 Because of Harmon Avenue below, there is a perfect view of the new City Center Complex, The Cosmopolitan and Planet Hollywood. To the north there are clear views of Paris, Bally's, Flamingo, Venetian, Wynn, Encore and the Stratosphere from the floor to ceiling glass. While tower 3 is the farthest from the MGM complex, it is connected by climate controlled walkway with moving sidewalks so it's only a 3-5 minute walk from the Tower 3 lobby to the MGM Studio Walk depending on your pace. In addition, being right off Harmon avenue, it is a short walk out the front gates at Signature down the street to the PH Westgate Tower where you can enter that property and be right in the Planet Hollywood miracle mile shops. Walking through there and the main Planet Hollywood casino will place you on the strip right across from Bellagio and adjacent to The Paris! Personally I use the onsite exercise room daily, and the free wireless internet for my guests is widely appreciated (there is nothing worse than having to pay $15-20 to check your e-mail!) Each of the 3 Signature towers has a pool and hot tubs. The pool in the middle (at tower 2) is heated year round at 85 degrees and gets plenty of winter time use. Guests can also use the very nice MGM pool during season at no cost. The hot tubs are operational year round, including of course the ones at the tower 3 pool, and are nice in the colder months. 3 phones in the unit, one on desk/table, one bedside, and one in the bathroom. Half sized refrigerator is in the unit. Ice machine is available just outside the room in the hallway near the elevators. Microwave and a range cook top are in the kitchenette. Kitchen has range top, microwave,refrigerator, blender, toaster, coffee maker and various necessary utensils. (4) Pool available at each of the 3 Signature towers. Pool at middle tower (tower 2) is heated year round to 85 degrees. Guests can also use the MGM pool & lazy river during season (see photos for pictures of pools). Beautiful property! Thank you for a fun week in Vegas! Thank you so much for sharing your beautiful home away from home with us! We had a great week in Vegas! Large room and bathroom. Clean with a nice view. Way better than staying in a casino! Thanks Monica, glad you enjoyed it! Come back anytime! Beautiful accommodations. Mark very responsive. Mr. Francis was wonderful to work with. We had a flight delay and were not able to check in the night we intended. Mr. Francis was completely understanding and helped us get checked into our room the next morning when we arrived. We would absolutely stay here again. The jacuzzi tub is already calling me to come back! Thanks Lacey for taking time to leave a nice review. Come back anytime! A fancy hotel in a great location! We walked to shops and restaurants from the Signature so the location was perfect. Room was clean and comfortable. The MGM Signature towers are part of the MGM complex. Guests can reach the main MGM property via climate controlled moving sidewalks that connect to the MGM Studio Walk near the MGM Pool, Convention Center and Monorail Station. Guests can easily reach City Center, Cosmopolitan, Planet Hollywood and points up the strip by exiting the front of the Signature property and making a short walk down Harmon Avenue. By using the Harmon Avenue entrance of the PH Westgate Tower guests can pass through the Planet Hollywood shops and casino and exit on the strip across from Bellagio and adjacent to the Paris Casino!